GASTONIA – The Gastonia Fire Department responded to the Webb Street School at 5:40 am for a fire in a storage trailer on Wednesday, September 25. EDGECOMBE COUNTY – Tuesday volunteer firefighters with the Conetoe Fire Department showed up to work to find thousands of dollars of life-saving equipment was stolen. WATAUGA COUNTY – The long-awaited completion of a new fire station serving the Meat Camp district north of Boone drew nearly 300 people to the ribbon cutting ceremony. BUNCOMBE COUNTY – Improvements in the way Swannanoa firefighters put down fires will now have a marked economic impact on residents. 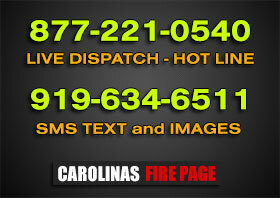 CHARLOTTE – A large home in the University area was being torn apart by fire late Tuesday night. NASH COUNTY – On September 13th, firefighters from Red Oak and Battleboro responded to a well involved tractor-trailer fire on Interstate 95. WILMINGTON – The Wilmington Fire Department and city residents gathered to dedicate the Wilmington Firefighter’s Memorial at Empie Park Fire Station.